LAS VEGAS, Nev. – Before massive themed resorts such as the Venetian and the Bellagio emerged from of the sand on the Las Vegas Strip, the action was on Freemont Street. 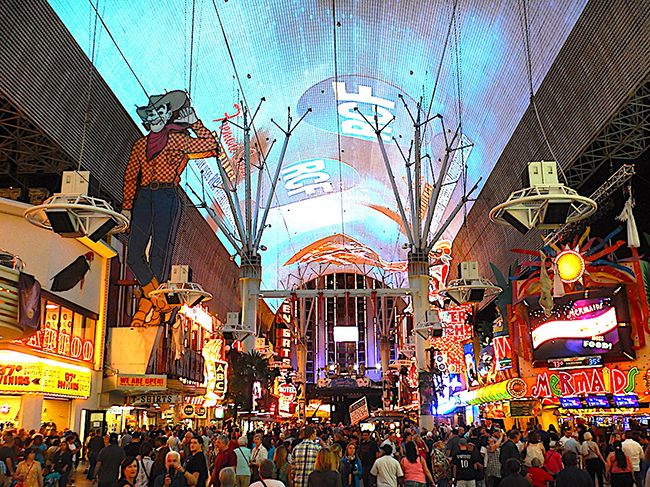 Activity in downtown’s original “Glitter Gulch” has ebbed and flowed over the years, but things are popping now in a walkable five-block stretch called the Freemont Street Experience. Be prepared for sensory overload. No vehicles are allowed, so the atmosphere is like a never-ending street festival. The most fun, of course, is a night. There’s enough blazing neon to make you wonder whether you need sunscreen, and an hourly spectacle called Viva Vision stuns you with 12 million LED lights displayed on a barrel vaulted canopy 90 feet overhead and stretching for 1,500 feet. Classic neon signs such as the 40-foot-tall Vegas Vic cowboy are complemented by blinking marquees beckoning you into casinos, gift shops with merchandise you likely wouldn’t show your Sunday school class and concerts from relatively big-name stars on three stages. When you hear an odd “whoosh,” look overhead to see people as they zoom just under the canopy on the SlotZilla zipline.